Paris is calling! 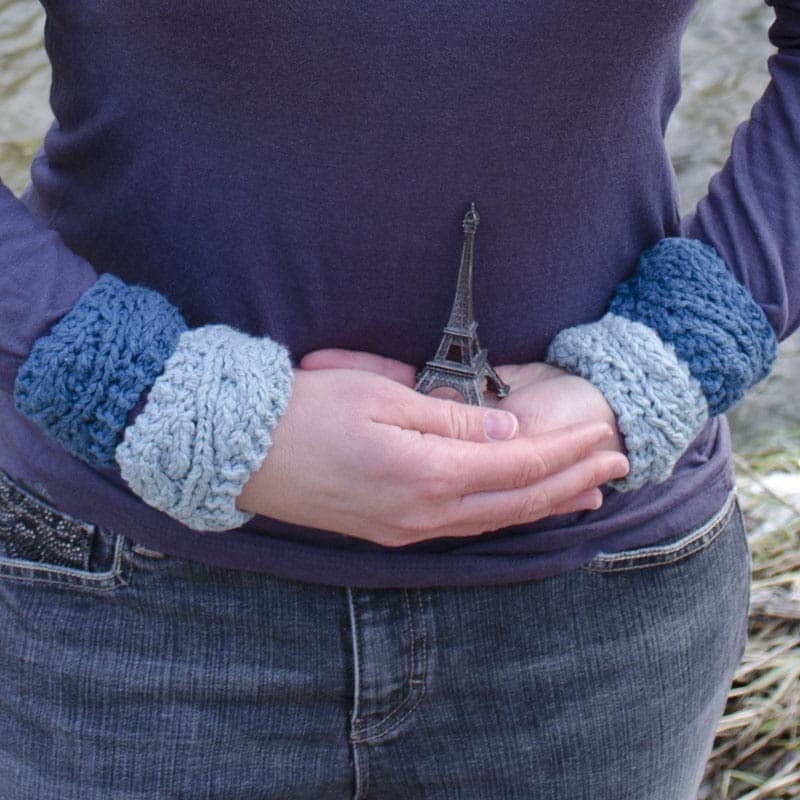 I designed these cuffs to conquer grafting fears before moving onto the Seine Cowl. 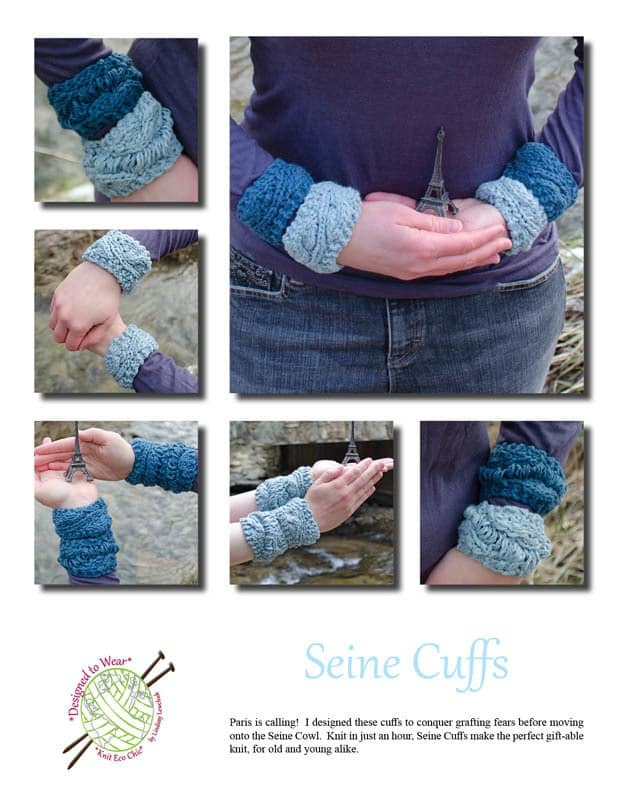 Knit in just an hour, Seine Cuffs make the perfect gift-able knit, for old and young alike. Wear individually on one wrist or multiples in a row, mix and match drop cuffs with non-drop cuffs for a custom look all your own. 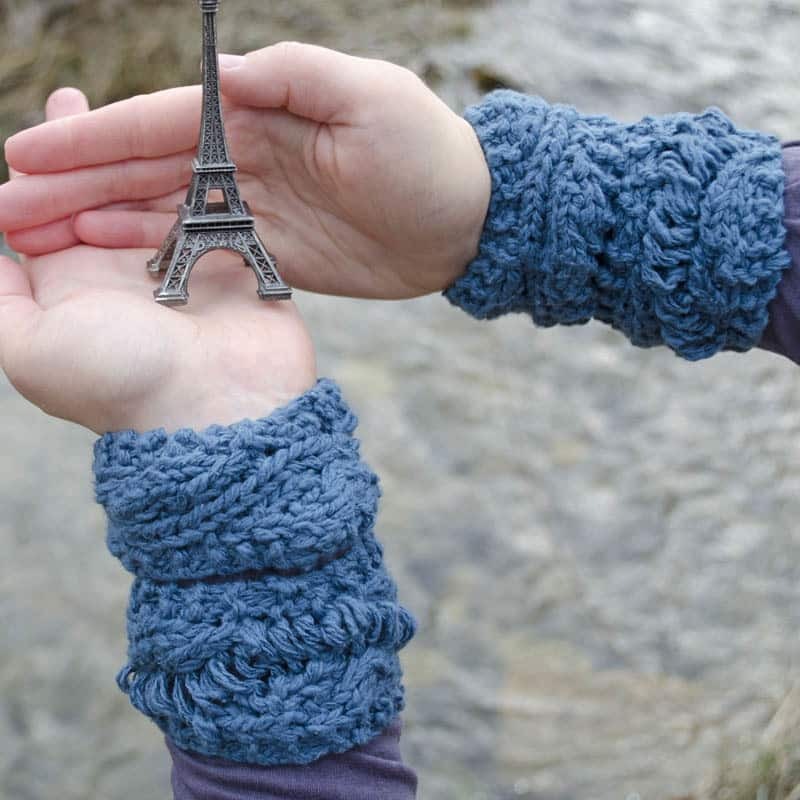 The tech edited and test knit pattern includes written directions, charts, and a You Tube video for both the long drop and the short non-drop versions. 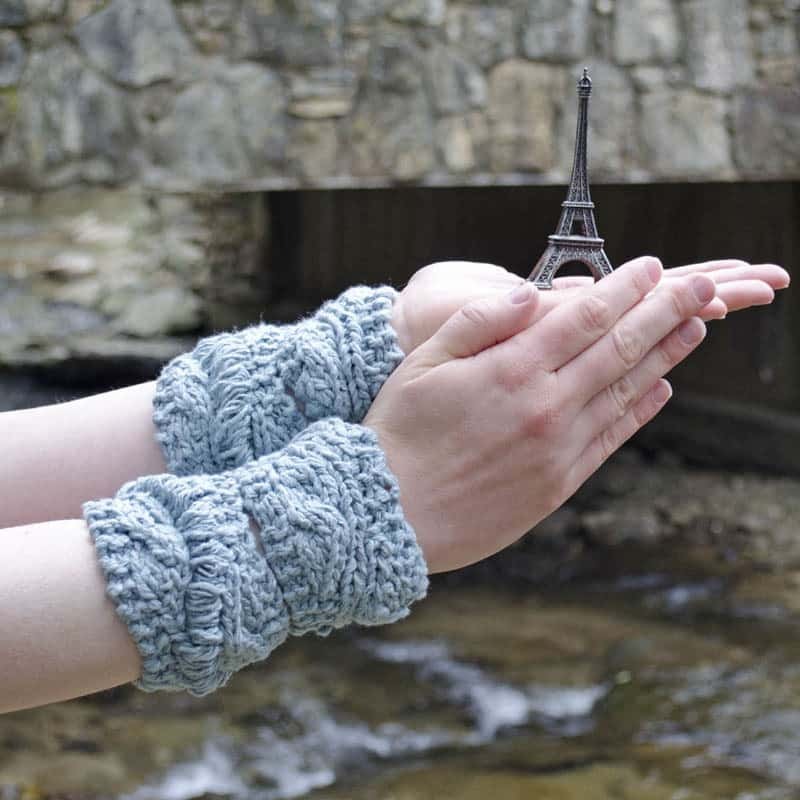 Pattern includes both Seine Cowl & Seine Cuffs! Length: Small (Large): 6.5”/ 16.5cm (8”/ 20.5cm). Width Drops Small (Large): 3”/ 7.5cm (3.25”/ 8cm). Width Non-Drops Small (Large): 2.5”/ 6.5cm (2.75”/ 7cm). 16 sts and 24 rows over 4”/ 10cm in Stockinette stitch. Samples shown with sport weight yarn held quadrupled using US 9/ 5.5mm needles. Note: Exact gauge is not crucial for the design but will alter yardage and finished measurements. 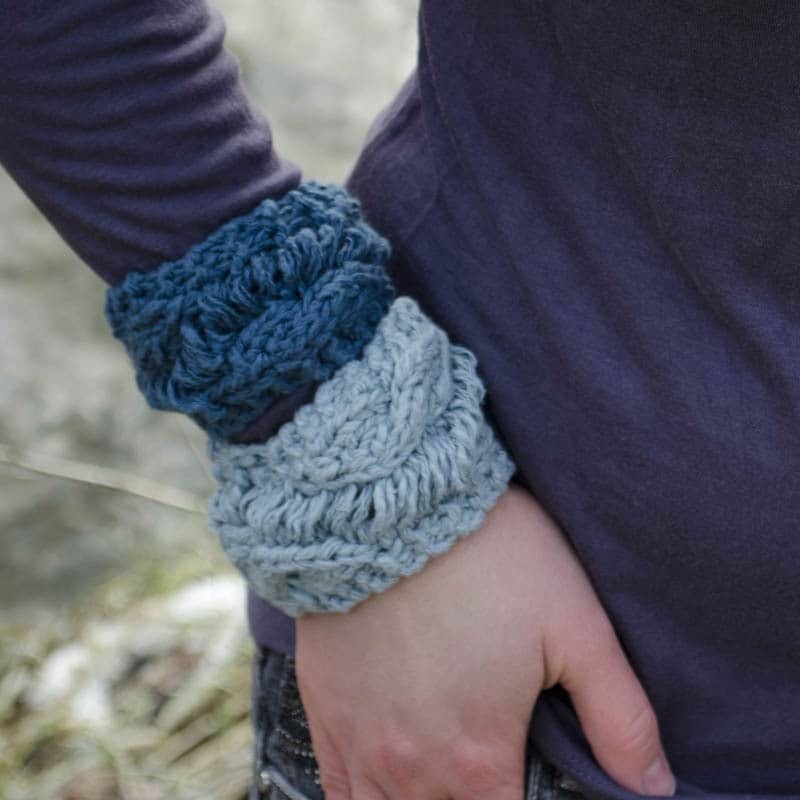 This stash busting design uses just 11 (15) grams/ 0.4 (0.5) ounces of yarn – approximately 50 (70) yards! Knit flat and then seamed. Directions include both a drop and non-drop version in two sizes – Small (Large). Break yarn up into four equal lengths before beginning.